The maya bird was the national bird of the Philippines until 1995 when it was replaced by the Philippine eagle. 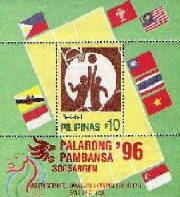 The Palarong Pambansa is the annual national games competition of the Philippines. It is an event where the best athletes from different regions of the country gather to compete for honor and glory in sports. Andres Bonifacio was the founder of the revolutionary society called the Katipunan and the father of the Philippine revolution of 1896. The booklet stamp features Jose Rizal who is a national hero of the Philippines. The booklet pane has the image of Fort Santiago, which is a historical place and a tourist spot in Manila.